Portable floral and foliage screening is such a neat solution for portioning various areas in gardens, on patios, in large conservatories or even on pavements. 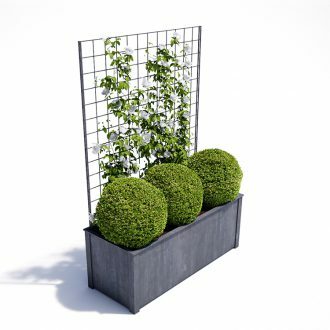 Reassuringly solid metal troughs and planters with built-in trellis have been a popular addition to the Garden Requisites well-crafted, galvanised steel range of square and circular planters. This month is the perfect time to plant up some trellis troughs with scented, colourful and/or green screen climbers. For inspirational mood board reference, do scoot over to our square metal planters & troughs Pinterest page. Firstly, consider any existing garden planting themes or layouts. Lead-look troughs look so smart in heritage and contemporary schemes, marrying beautifully with period and modern properties. Is any adjacent planting design informal or formal, majoring on minimal shapes and textures, flouncy flower-themed or wonderfully wildlife friendly? You can mirror these styles in trough planters for a unified, consistent look. We’ve gladly gathered some horticultural help in the form of some small climbers to train up your metal trough trellis. 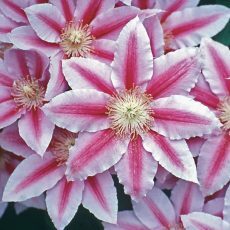 Clematis make lovely, quick growing container plants, especially if trained up a small trellis. Cultivars such as C.‘Barbara Jackman’ (purple/pink), C.‘Miss Bateman’ (white), or C.’Bee’s Jubilee’ (pink) are ideal as they’re small-growing. Sweet peas and miniature climbing roses such as David Austin’s ‘Warm Welcome’ are wonderful for scent as well as bold colour statements. To encourage bees and butterflies and other pollinating insects to the garden, there are all sorts of options available. Think about the base plants as well as the climbers. Top of the list of bee and butterfly friendly climbers are Lonicera (Honeysuckle) and the striking, showy Passiflora (Passion flower). Border a space with heady, scented climbers too. Deliciously fragrant Trachelospermum jasminoides (Evergreen Jasmine) is proving more hardy than previously thought and can be pruned in early spring to keep to the required size. Trellis troughs can also be cleverly employed as edible garden features in small gardens or on balconies. Consider training juicy, sweet, climbing Cherry tomatoes or prolific Mangetout for tasty, space-saving crops. Garden Requisites’ hand-crafted British-made trough planters are super sturdy and weather-proof – very long-lasting, future heirlooms. Adding to a collection of complimenting pieces – planters, trellis fencing, arches, even door canopies or gazebos – can really add wow factor to garden designs. We hope we’ve helped get the spring/summer gardening urges going and that your gardens are taking shape. If you have any questions on bespoke sizing, do give us a call.